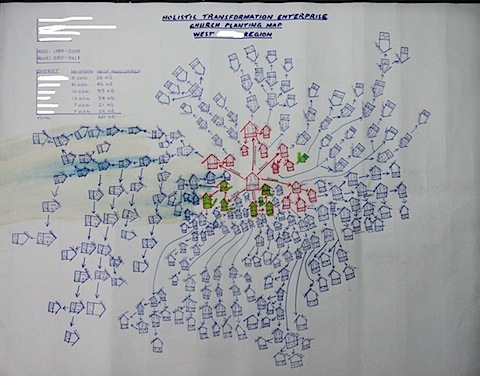 This map just came in from a MOVE worker in South Asia. It shows the generational growth of a church planting movement (CPM). Each house represents a neighbourhood or village church and it’s generational growth. Notice the houses drawn in red. They were started between 1999-2009. That’s over ten years. (The dates on the map are incorrect). The houses in blue were started between 2010-2011. That’s two years. The difference, some basic training on applying CPM principles. The map covers the western portion of a region that has 90 million people. There are similar works going on to the north, south and east. Trained workers have planted 1,600 churches in the last two years. The goal is 45,000. Some details have been deleted due to security concerns.